Background: Silicosis is a known occupational lung disease prevalent among stone mine workers. It is commonly characterized by cough and shortening of breath, and is occasionally associated with tuberculosis and lung carcinogenicity. Silicosis is one of the major occupational disease all over the world and poses detrimental health effects to the workers in developing countries like India. Objective: The present study was conducted to assess the level of awareness and knowledge of silicosis among stone mine workers. Subjects and Methods: It was a personal questionnaire-based study conducted among stone mine workers of Jodhpur and Nagaur district of Rajasthan, India. The study was conducted during October 2016, and was based on close-ended questions related to silicosis awareness. The study subjects (n = 305) were 30 years or more. The questionnaire was divided into different sections: demographic characteristics, knowledge of silicosis, lifestyle, and educational level. Results: The results of the study revealed that education or literacy highly affects the knowledge about silicosis among stone mine workers. The awareness index was found nonsignificant for the alertness of silicosis in contrast to regions, age groups, and habit of two regions and was significant for literacy in two regions. Conclusion: This study concluded that the education level of mine workers affected the knowledge of silicosis. Free seminars, symposiums, and medical camps should be organized to make miners more aware of silicosis. Silicosis is an occupational lung disease prevalent among miners as well as workers of manufacturing and construction industries. It is a preventable disease caused by the inhalation of dust-containing silica generated during various mining activities. In both developing and developed countries, silicosis is one of the main health hazards.,,, Silica exists in amorphous and crystalline forms. Amorphic silica imparts comparatively less toxicity than the crystalline form, which exhibits polymorphs like tridymite, cristobalite, and quartz. Earth's crust comprises silica in abundance, mainly composed of quartz dust. Mining activities such as drilling, cutting, and crushing of minerals and rocks containing crystalline silica releases free silica in the working environment. The inhalation and deposition of silica dust particles results in persistent inflammation along with granuloma formation and fibrosis of lung tissues, resulting in the reduction of the functional capacity of lungs.,, Occupational exposure to respirable crystalline silica dust particles is a causal agent of several occupational health hazards such as chronic obstructive pulmonary disease (COPD), silicosis, and pulmonary tuberculosis. Silicosis can be categorized as acute silicosis, accelerated, and chronic on the basis of radiological findings and length of silica exposure. As silicosis is associated with several disorders such as tuberculosis and lung cancer, it contributes to occupational morbidity and mortality. Toxic effects of silica to alveolar macrophages are reported to play a vital role in triggering cellular mechanisms such as oxidative species generation and secretion of inflammatory cytokines, chemokines, and fibrogenic mediators, which are lethal to cells. The epidemic of silica-associated disorders is common among workers of low and middle-income countries like India, China, Brazil, and South Africa., In a developing country like India, mining is one of the important occupations with approximately 1.7 million workers at a high risk of exposure to respirable silica. Many attempts have been made for mitigating the prevalence of silicosis as it is one of the major global health hazards. As silicosis is incurable but a preventable disease, awareness about its causation is the main tool for its prevention. The present study was conducted to assess the awareness for silicosis among the stone mine workers of Jodhpur and Nagaur districts of Rajasthan, India. The study was conducted for assessing the awareness regarding silicosis among 305 stones mine workers from Jodhpur and Nagaur district of Rajasthan. The study included a questionnaire regarding the knowledge and awareness of silicosis conducted in October 2016. The subjects participated in this study were aged >30 years. The questionnaire was divided into four different sections. Section 1 included basic information such as name, mine address, etc., whereas section 2 comprised work details like work history, present working, working role, average working hours and use of safety equipment during work. Section 3 covered details regarding the awareness and knowledge of silicosis, and included five questions regarding the awareness, symptoms, causes, precaution taken to prevent silicosis, and knowledge about another related lung disease. Section 4 contained information about the subject's medical history and education status. The questionnaire was administered both in Hindi and the vernacular language; it took approximately 5–10 min for each subject to complete the questionnaire. In such a questionnaire study, questions help determine the specific aspect of the subjects' awareness and knowledge, a single measure (awareness index) also summarizes this measure in a convenient form for identifying the determinants of such perceptions and in reporting study results to a broad audience. This awareness index is considerably helpful for compiling a reliable report with a permissible measure of awareness in a simple, easy-to-understand, and accurate manner. In the present study, an awareness index was also generated according to Benz et al. Overall, silicosis awareness is defined in the term of silicosis awareness (SA), knowledge of silicosis symptoms (SS), knowledge of the cause of silicosis (SC), knowledge of lung disease (SLD), and knowledge of protection awareness (SPA). On the basis of these five questions, Silicosis Awareness Index (SAI) was calculated. SAI is calculated by averaging the arithmetic mean of the five measured elements of silicosis awareness. This arithmetic mean shows the total number of survey questions. The scale for every indicator ranges from 0 to 1. Data were processed using software R (Bell laboratories, GNU GPL; version 3.3) for comparing the results among two different district subjects. Chi-square test was applied for comparing proportions between groups, and significance were considered at different levels P < 0.05, P < 0.01, and P < 0.001 accordingly. Out of the 305 mine workers, 52.46% were from Jodhpur while 47.54% belonged to Nagaur district. [Table 1] depicts the distribution of workers as per age groups for two different regions. Approximately half of the subjects belonged to a young age group (30–40 years) in both districts. [Table 2] shows the distribution of workers as per work exposure. It is observed that most mine workers of Jodhpur district had exposure of 11–20 years, while in Nagaur district most mine workers belonged to 0–10 year group. [Table 3] presents the distribution of workers as per awareness of the term silicosis in the study regions. In both study areas, the awareness about the term of silicosis was low, about 41.2% in Jodhpur and 40% in Nagaur district. 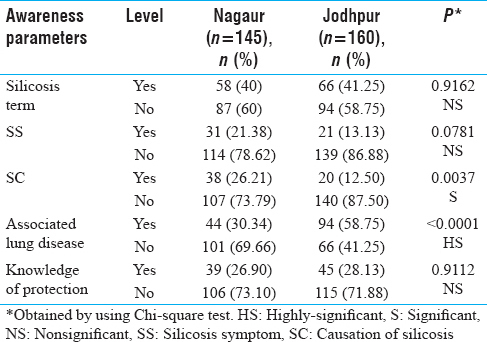 Although the awareness about the term silicosis in Nagaur and Jodhpur district was ~40%, the awareness regarding the causes and symptoms related to silicosis were very low. [Table 4] explains the results related to other parameters of silicosis awareness. The survey showed that only 21.38% subjects of Nagaur district and 13.13% Jodhpur district subjects had knowledge of silicosis symptoms. Similarly, only 26.20% from Nagaur and 12.15% from Jodhpur reported awareness about causation of silicosis. Apart from the symptoms and cause of silicosis, subjects from both districts did not have much awareness regarding protection measures to avoid silicosis. Only 26.9% of workers from Nagaur district and 28.13% from Jodhpur were aware of protection measures to avoid silicosis. About 60.68% of Nagaur district subjects used protective equipment like a helmet, hand gloves, and nose mask, during working, while 70.63% Jodhpur subjects uses such equipment. Although a high percentage of subjects used protective equipment in the field during working, they were not aware of the protection measures for avoiding silicosis. [Table 5] shows the descriptive statistics for awareness index according to age groups. It shows that, in Nagaur district, maximum awareness index was found 0.4 with a median of 0.2 in the age range 41–50 years, while the minimum was 0.20, for >60 years age group. However, for Jodhpur district, maximum awareness index was 0.33 with median of 0.2 for 31-40 years age group, and the minimum was 0.26 with a median of 0.2 in the >60-year age group. The awareness index difference between different age groups for both regions was calculated using Kruskal–Wallis test which was statistically insignificant, as indicated by P value > 0.05. [Table 6] shows the descriptive statistics for awareness index according to literacy. In Nagaur district, the maximum awareness index was 0.60 with a median of 0.8 for education level more than high school (10th grade), while the minimum was 0.20 for the illiterate group. In Jodhpur, the maximum awareness index was 0.50 with a median of 0.5 in the education level more than high school (10th grade), and the minimum was 0.11 with a median of 0 for the illiterate. 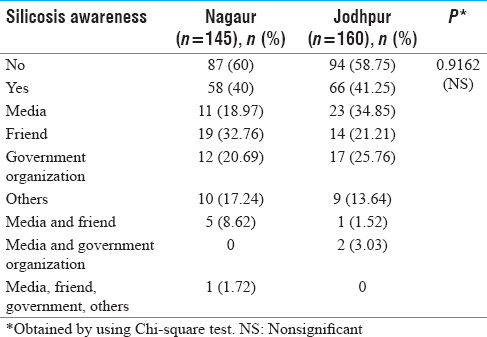 The awareness index difference between different literate groups for both regions was calculated using Kruskal–Wallis test and was statistically significant in Nagaur district subjects and highly significant in Jodhpur district subjects, as indicated by P values of 0.0459 and 0.0001, respectively. Rajasthan is famous for various stones right from sandstone to marble and granite. The stones comprise a significant percentage of silica, and hence, workers who are engaged in their processing are exposed to high levels of silica dust, which eventually causes silicosis in the concerned personnel. There are regular reports of deaths of persons suffering from silicosis in Rajasthan. An epidemic of silicosis is on-going in Rajasthan with thousands of silicosis patients diagnosed in recent past. This questionnaire helped to determine the status of stone mine workers' knowledge and awareness regarding silicosis and another related lung diseases, and thereby curriculum and suggestions will be developed to increase awareness. The results have shown that the designed questionnaire with 11 questions was able to assess the awareness of silicosis, with good validity and reliability. The validity of the questionnaire was very accurate and high owing to face-to-face content interview methods used for obtaining information. According to the findings in both mines, the subjects belong to middle-age group (30–60) were fairly high in number. Work experience is an important factor that influenced factors such as health and knowledge regarding the disease where the workers are working. It was observed that the most workers had a longer duration of work experience and some of them had adopted this occupation as their family business, while few were freshers in this sector. It was observed that a limited numbers of subjects of Nagaur district and Jodhpur district (13–21%) had knowledge of silicosis symptoms while most were not aware of the exact cause of silicosis. Apart from the symptoms and cause of silicosis, subjects from both districts were also not aware of the preventive measures to be adopted for minimizing the risk of silicosis. It was also seen that the subjects belonging to both Nagaur and Jodhpur districts were equally aware of the term silicosis, its causes, and awareness about silicosis. Moreover, there was a significant difference in the awareness regarding causation of silicosis and associated lung disease with silicosis. It was also observed that the knowledge regarding the use of protective equipment while working was less (26.9–28.13%), which is associated with a strong risk of silicosis and lung cancer. Some previous studies showed a two-fold increase in lung cancer risk in groups with the highest cumulative exposure to crystalline silica. This systematic study showed that various communication mediums such as media, government agencies, and social agencies play a beneficial role in creating awareness regarding silicosis and other occupational health hazards among mine workers. This study also revealed that lack of literacy among mine workers may have imparted negative effects on awareness regarding silicosis, which was also explained by the awareness index [Table 6]. Subjects having education level up to high or higher school or above were more aware of the causes of silicosis, prevention, and other related information. From awareness index related to the age and silicosis awareness, [Table 5] also revealed that young people were much more aware of silicosis and other related information, which was due to the education level of individuals. Because of limited resources, the present questionnaire has few unavoidable limitations. First, due to the limited scale of the study, no control group (nonstone mine workers) was included for comparison. Second, the exposure measurements for each and every mine worker were not represented in this study. Silicosis is a noncurable disease which can arise due to the inhalation of respirable crystalline silica dust causing persistent inflammation, and finally, reduction in the lung function. Therefore, the control over silicosis lies mainly in the prevention, which is common among stone mine industries workers. The study concluded that the education level of mine workers highly affected the knowledge of silicosis among them. Furthermore, lack of literacy and less knowledge regarding the use of protective measures can produce a surplus effect. It is suggested that free seminars, symposiums, and medical camps are required at different levels at medical centres to increase the awareness about the cause and complications for silicosis among stone mine workers. Mossman BT, Churg A. Mechanisms in the pathogenesis of asbestosis and silicosis. Am J Respir Crit Care Med 1998;157:1666-80. Cassidy A, 't Mannetje A, van Tongeren M, Field JK, Zaridze D, Szeszenia-Dabrowska N, et al. Occupational exposure to crystalline silica and risk of lung cancer: A multicenter case-control study in Europe. Epidemiology 2007;18:36-43. Leung CC, Yu IT, Chen W. Silicosis. Lancet 2012;379:2008-18. Sharma N, Kundu D, Dhaked S, Das A. Silicosis and silicotuberculosis in India. Bull World Health Organ 2016;94:777-8. Rees D, Murray J. Silica, silicosis and tuberculosis. Int J Tuberc Lung Dis 2007;11:474-84. Thomas CR, Kelley TR. A brief review of silicosis in the United States. Environ Health Insights 2010;4:21-6. Kawasaki H. A mechanistic review of silica-induced inhalation toxicity. Inhal Toxicol 2015;27:363-77. Pollard KM. Silica, silicosis, and autoimmunity. Front Immunol 2016;7:97. Santos C, Norte A, Fradinho F, Catarino A, Ferreira AJ, Loureiro M, et al. Silicosis-brief review and experience of a pulmonology ward. Rev Port Pneumol 2010;16:99-115. Nasrullah M, Mazurek JM, Wood JM, Bang KM, Kreiss K. Silicosis mortality with respiratory tuberculosis in the United States, 1968-2006. Am J Epidemiol 2011;174:839-48. Souza TP, Watte G, Gusso AM, Souza R, Moreira JD, Knorst MM, et al. Silicosis prevalence and risk factors in semi-precious stone mining in Brazil. Am J Ind Med 2017;60:529-36. Benz JK, Espinosa O, Welsh V, Fontes A. Awareness of racial and ethnic health disparities has improved only modestly over a decade. Health Aff (Millwood) 2011;30:1860-7. Amandus HE, Shy C, Castellan RM, Blair A, Heineman EF. Silicosis and lung cancer among workers in North Carolina dusty trades. Scand J Work Environ Health 1995;21 Suppl 2:81-3. Kachuri L, Villeneuve PJ, Parent MÉ, Johnson KC; Canadian Cancer Registries Epidemiology Group, Harris SA, et al. Occupational exposure to crystalline silica and the risk of lung cancer in Canadian men. Int J Cancer 2014;135:138-48.